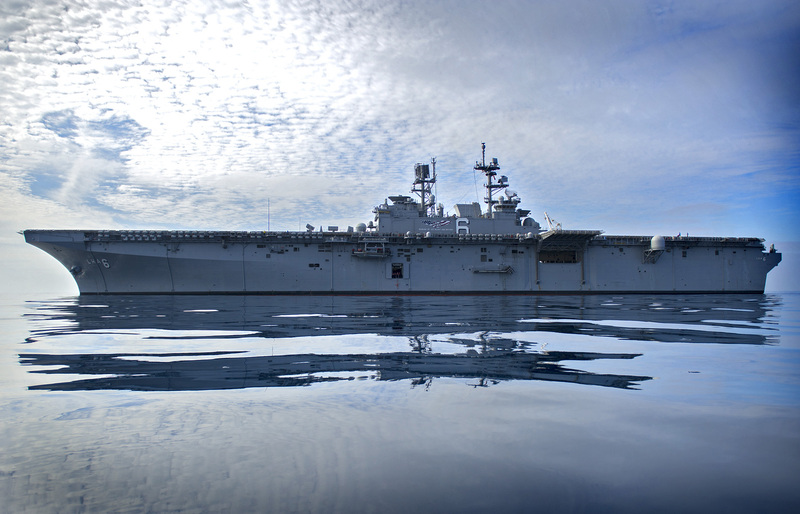 The amphibious warship USS America (LHA-6) headed out to sea on Monday after completing ten-month maintenance period that included strengthening its deck to accommodate Marine F-35B Lighting II Joint Strike Fighters. The ship left its homeport in San Diego for additional testing off the coast of Southern California, according to the service. The aviation-centric big deck was commissioned in late 2014 but required additional work to take the day-to-day strain of operating the short takeoff and vertical landing (STOVL) strike fighters that will operate from the ship. The $3 billion, 44,850-ton ship is the first of two America-class amphibious ships that have been built without a well deck to emphasize support for aviation assets like the F-35 and the MV-22 Osprey tilt-rotor. The follow-on Tripoli (LHA-7) will undergo a similar – but shorter — maintenance availability following delivery to accommodate the F-35s which some of the deck strengthening work already underway at Ingalls Shipbuilding in Pascagoula, Miss. The third ship in the class – the unnamed LHA-8 – will be built with the stronger deck in production and will include a well deck to allow the ship to deploy amphibious landing craft in the same way as traditional big-deck amphibs. The contract for LHA-8 will be built at Ingalls or General Dyanmics NASSCO in San Diego as part of a contracting deal in which one yard will build the amphib and the other yard will build six John Lewis-class (T-AO-205) fleet oilers – formerly known as TAO(X).